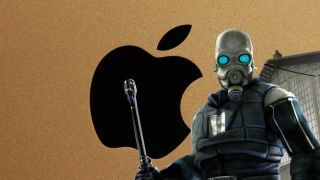 Valve boss Gabe Newell has put rumours of an Apple-built Valve hardware to bed, saying that no one from the company has met with Tim Cook. It's taken a while for Valve to confirm this though, as the rumour that Cook had visited the company last week was so well crafted that even Valve assumed they were true. In an interview with Seven Day Cooldown, Newell said, "We actually, we all sent mail to each other, going, 'Who's Tim Cook meeting with? Is he meeting with you? I'm not meeting with Tim Cook'." "It's one of those rumours that was stated so factually that we were actually confused." "No one here was meeting with Tim Cook or with anybody at Apple that day. I wish we were! We have a long list of things we'd love to see Apple do to support games and gaming better. "But no, we didn't meet with Tim Cook. He seems like a smart guy, but I've never actually met him." Who knows what really happened – maybe someone who looked a bit like Tim Cook popped in to Valve HQ that day. Or maybe it was someone in a Tim Cook mask. Or perhaps it was just a lie. Either way, those fevered dreams of an Apple-made Valve-powered games console will have to stay firmly in the internet's imagination. Although… if you wanted to hide the fact that you'd had what was supposed to be a top secret meeting with the CEO of Apple, what would you tell the internet? It's a double bluff! Reverse psychology! Gabe Newell is totally playing us! Oh god, what have we become?